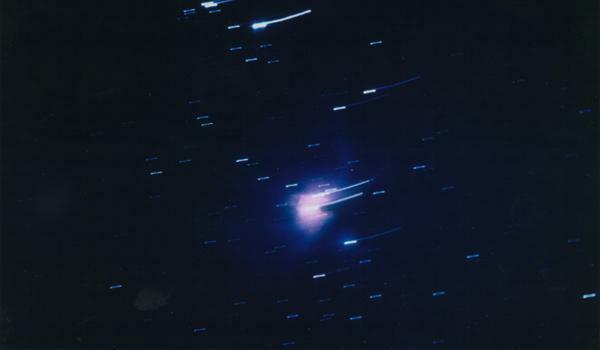 Both images taken 11/26/01 with a Canon EOS Rebel 35mm , 15 minute exposure. As you can see in these 2 images I had somewhat of a tracking problem, not bad for my first time at deepsky objects. The first image is the Double Star Cluster NGC 869&884 (NGC= New General Catalog) There are about 700 stars in this cluster, the 10 brightest are blue giants and have a luminosity of 7,500 to 70,000 times that of the Sun, there are about 20 red super giants. NGC 869 lies about 7,200 light years from Earth and NGC 864 about 7,500 light years, the cluster has a diameter of 70 light years, its age is around 6 million years. One light year equals the distance light travels at 186,000 mls per second in one year, which is a about six trillion miles. It is hard to comprehend a trillion miles, so think of it this way, if the Earth was 1 inch from the Sun, then our nearest star other than the Sun which is Proxima Centauri, and about 4 light years from Earth, it would be 4.3 miles away. 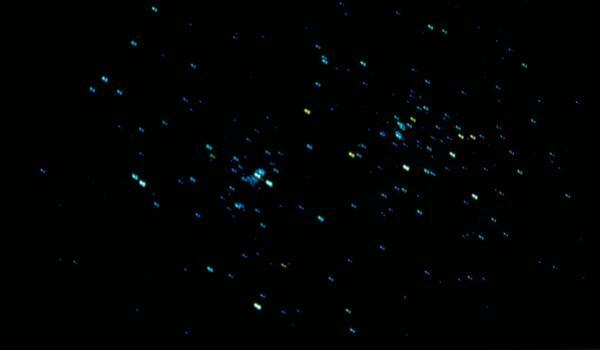 This image does not do justice for the cluster, through the eyepiece, it is like dimonds in the sky. This is The Great Orion Nebula. There are 4 young stars (about 50,000 years old) in the center of the nebula called the Trapezium. The Orion Nebula is a hot bed of star formation. It lies about 1,400 light years from Earth. Protoplanetary disk (new born solar systems) have recently been discovered around five developing stars in this region.